Ariduka55, also known as Monokubo in social media circles, is a 24-year-old Japanese artist. 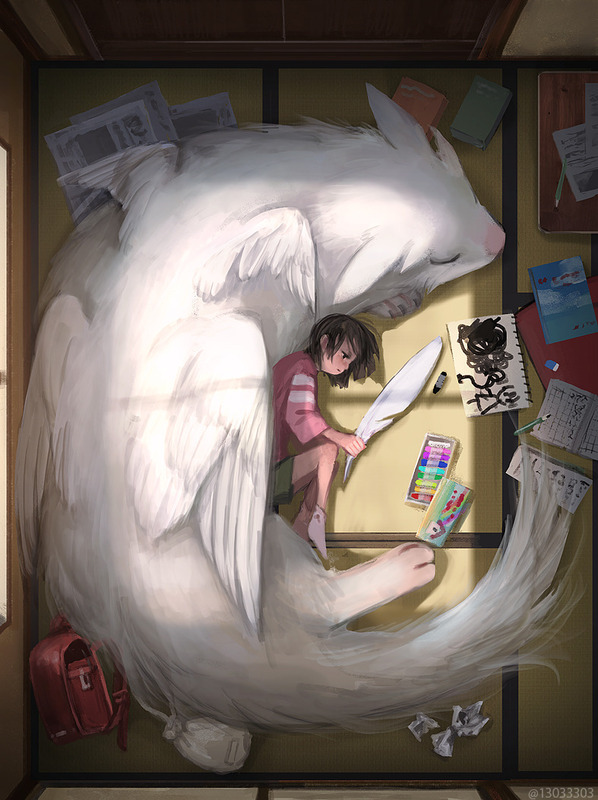 Finding her inspiration in natural landscapes and the illustrations of a variety of other artists, she got the idea to include giant animals living beside their human counterparts from Studio Ghibli. 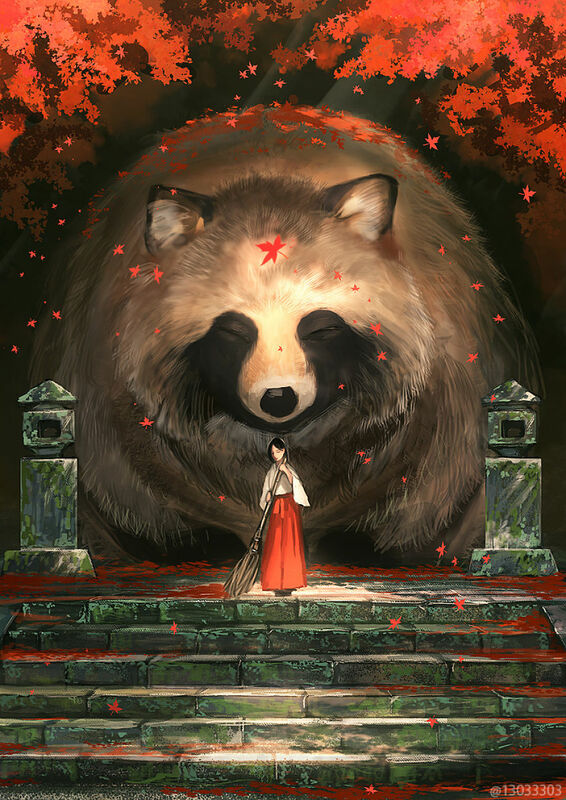 Studio Ghibli has produced such anime masterpieces as “Princess Mononoke,” “Totoro,” and “Howl’s Moving Castle,” among many others. 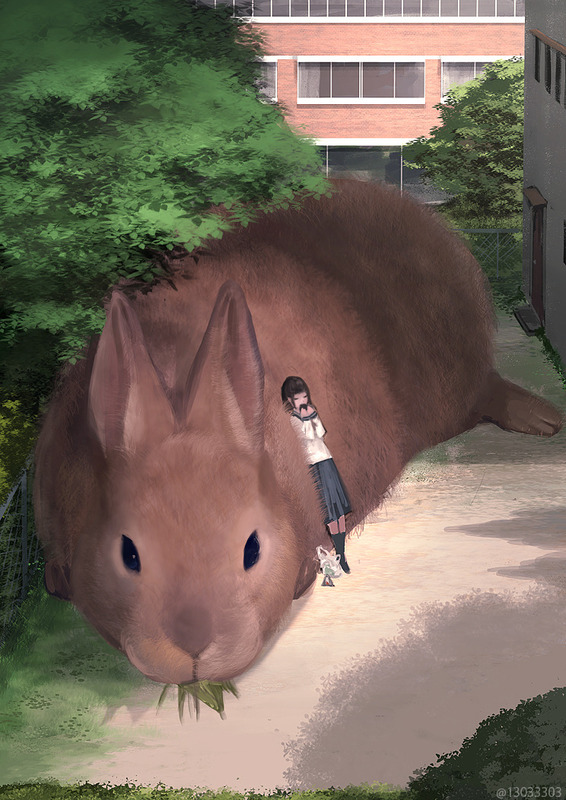 The studio is especially known for featuring large-sized animals in its films, many of which have become a favorite of anime lovers worldwide. 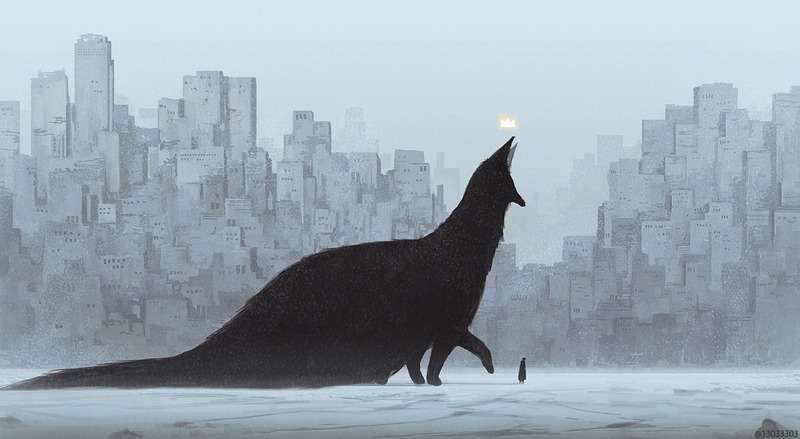 With this inspiration in mind, Arikuda55 has created a world where her giant-sized animals live right alongside their human companions. The ethereal and peaceful atmosphere of her compositions makes them a favorite among her fans. 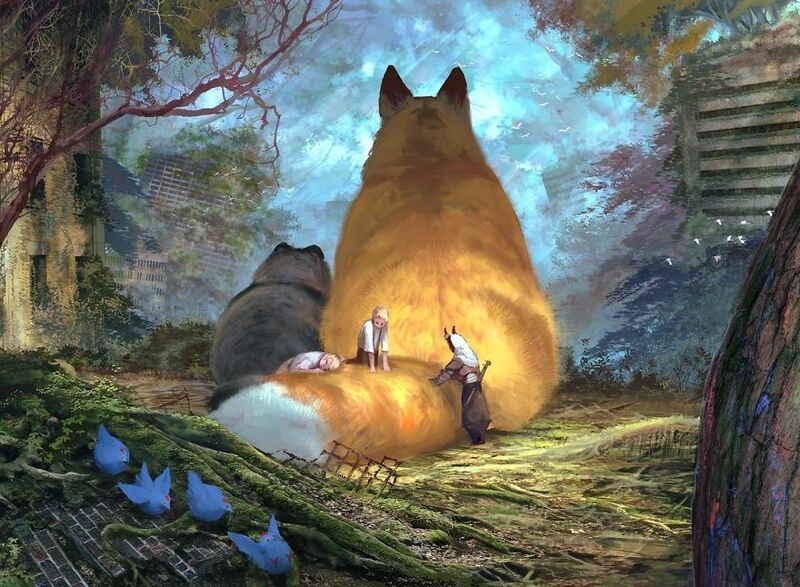 Here is a selection of Arikuda55’s artwork featuring giant animals in a magical, fantasy world. All this fox needed was a hug. I wonder what happened. The tears flowing down its face tell a story of sadness and loss. 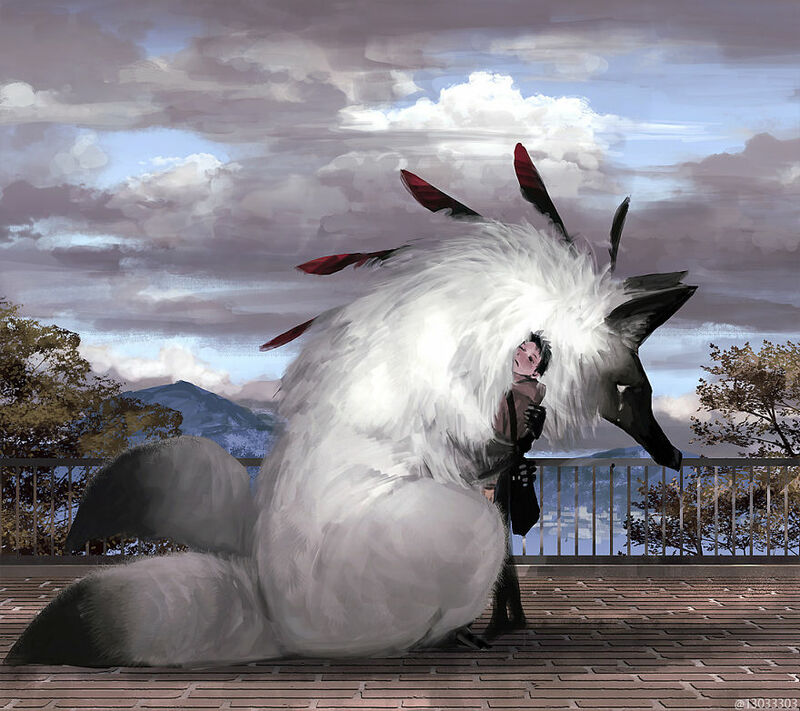 Maybe the guy should give it a hug for each tail for good measure. 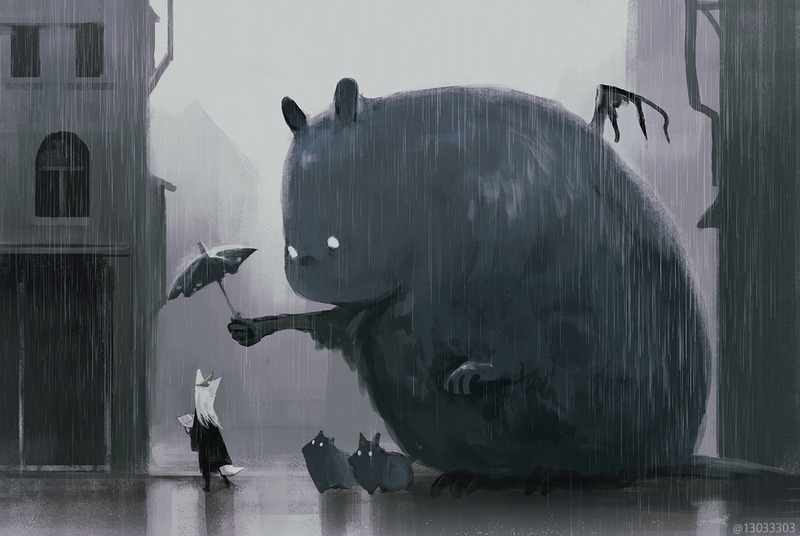 This sweet creature is holding an umbrella over its friend to keep them dry. 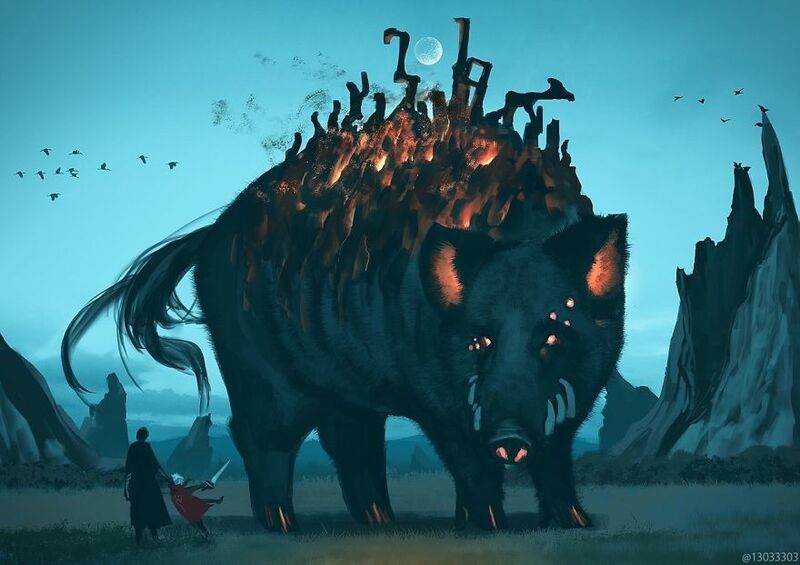 You can also see its body shielding the smaller creatures. It just goes to show that even though someone could look big and scary, that sometimes the biggest hearts com in big packages. Here are two friends taking an afternoon nap in the sun. 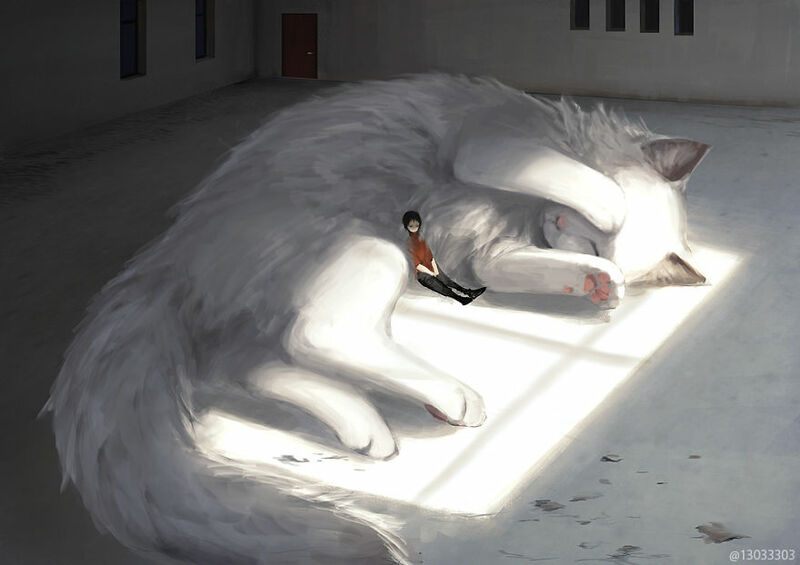 That person does look nice and comfy tucked into the fur of its animal companion, though the cat does have the sun in its eyes. 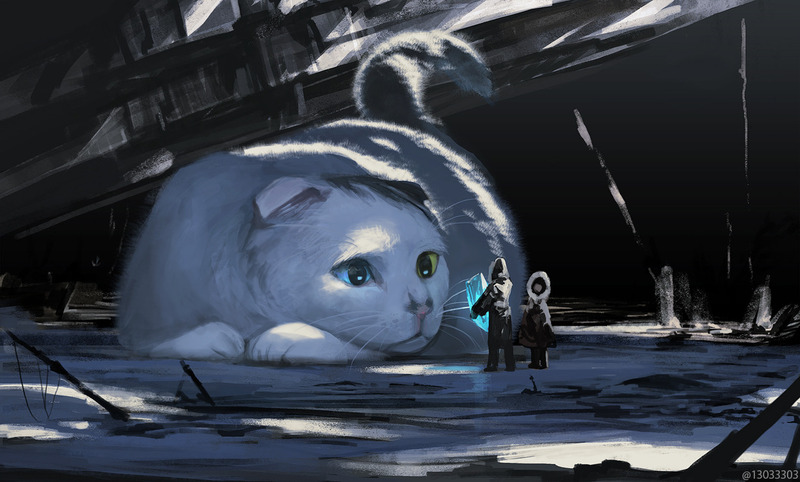 This giant cat seems to be entranced by the sparkly blue thing the two people are carrying. I wonder if that is a gem or is it just blue ice. 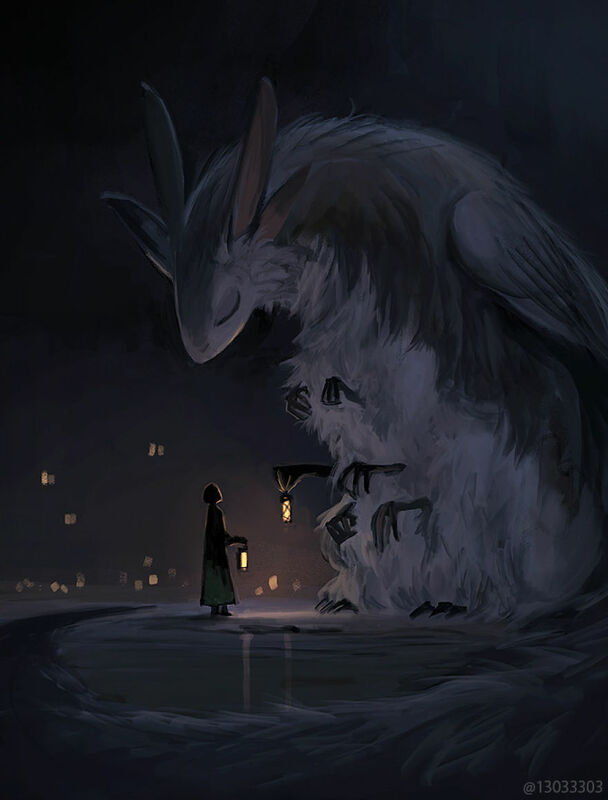 Here is a strange, multi-legged creature meeting with a friend in the dark. Lucky for them that they both have lanterns, or they might get lost. Hopefully these two are friends and this isn’t just a chance meeting. 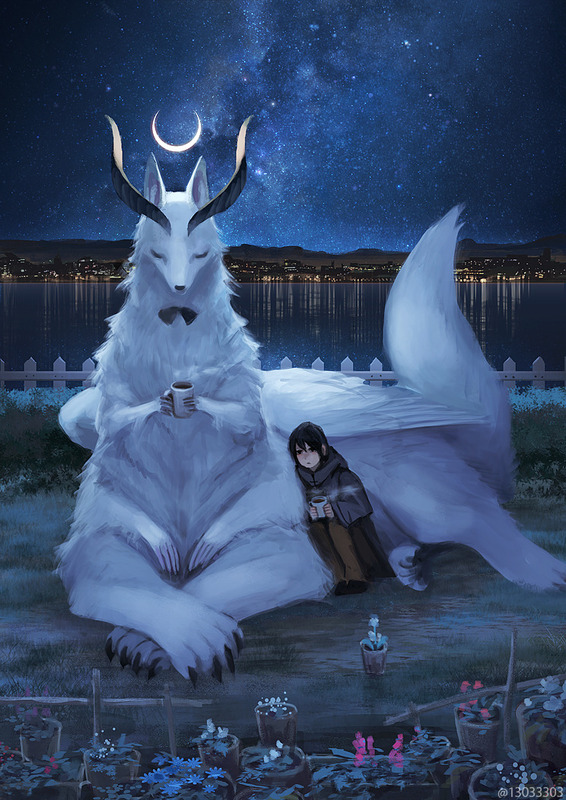 These two friends are sharing a mug of hot cocoa on a cool spring night. It looks like they are simply enjoying each other’s company as they sit quietly beside the roadside flowers. 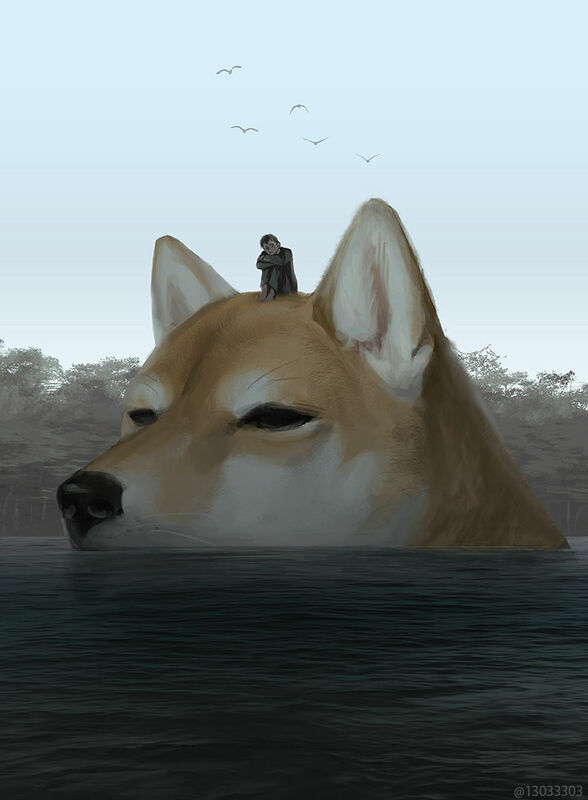 This large mutt is giving someone a ride across the river. This scene kind of reminds me of the story about the gingerbread man who got a ride across the river atop the fox. Of course the fox ate him. I hope that is not this man’s fate. 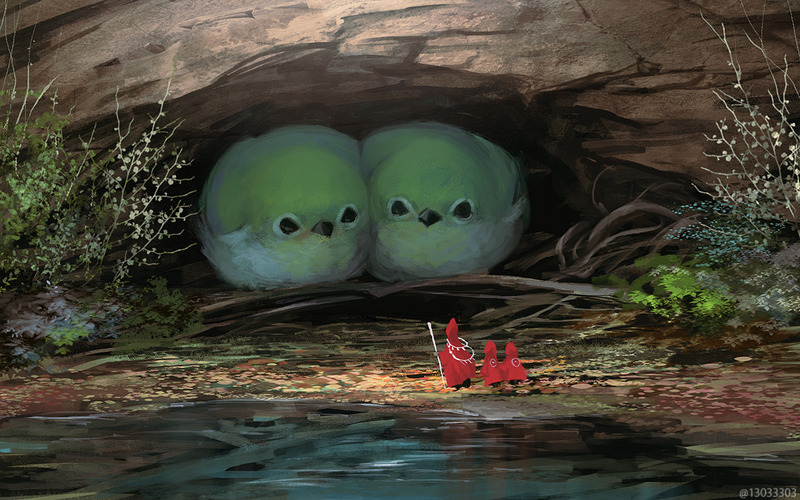 These two, ahem, little chicks are hiding in a cave beside the forest path. Are they scared of the three people who are walking innocently along, or are they merely curious? This dog obviously has no idea of how to play hide and seek. He must be of the mindset that if he can’t see someone, they can’t see him either. These two friends are taking a break from their day to eat a snack. The bunny seems to be content with a mouthful of greens, while her human companion munches on a sweet roll. 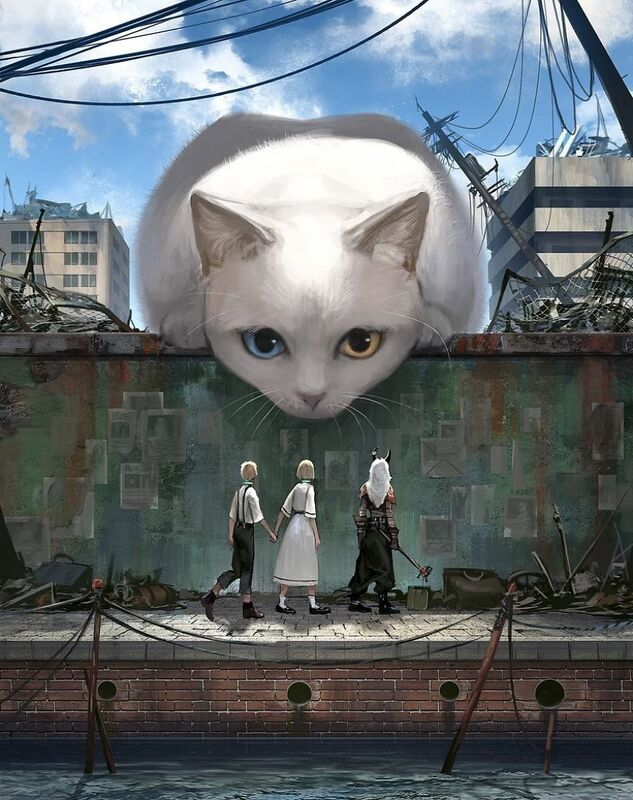 This large, white cat seems to have caught these three strangers by surprise. I think she is just curious with her one blue and one golden eye. She doesn’t look like she is any harm either way. This young kid seems to be happy with simply lying curled up with his favorite animal friend. His friend even gave him one of his feathers to look at while she took a nap. These two buddies are taking in some rest by the side of the ocean. It looks like they are also taking in some sun while taking a break from journaling. 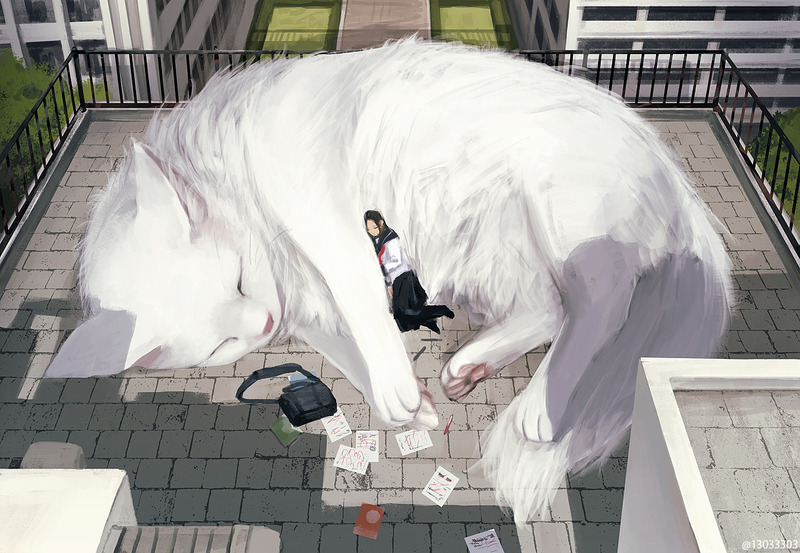 Here is another human and her owner cat getting their 40 winks on top of a building. The human better wake up though or all of her papers are going to blow away. 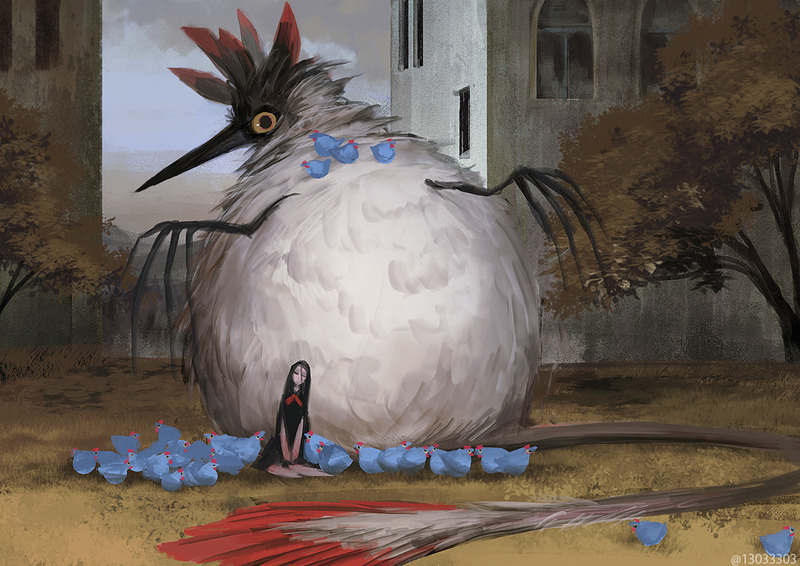 This big bird looks like she is well liked by the blue chickens. She almost looks like one herself. Her human companion also seems to get along well with the blue avians. 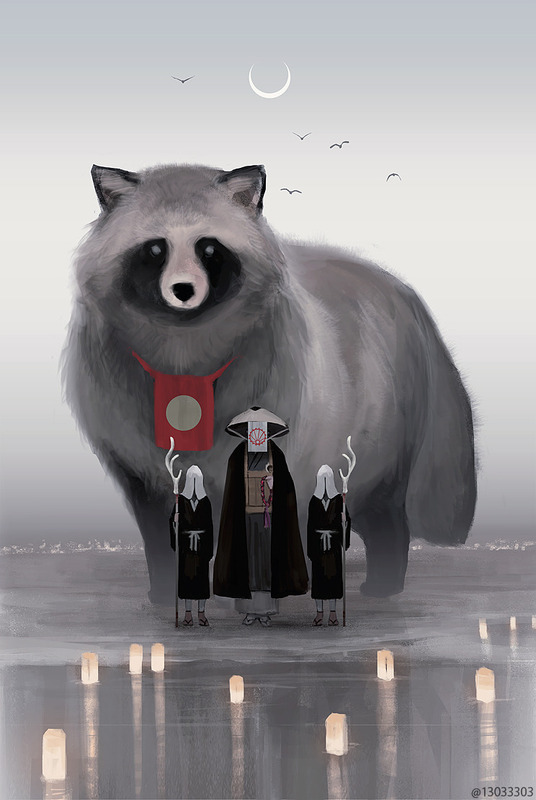 These warriors have an ally in this large, raccoon. He must be trained since he seems to be wearing their colors. I do wonder who is more ferocious, him, or the warriors. 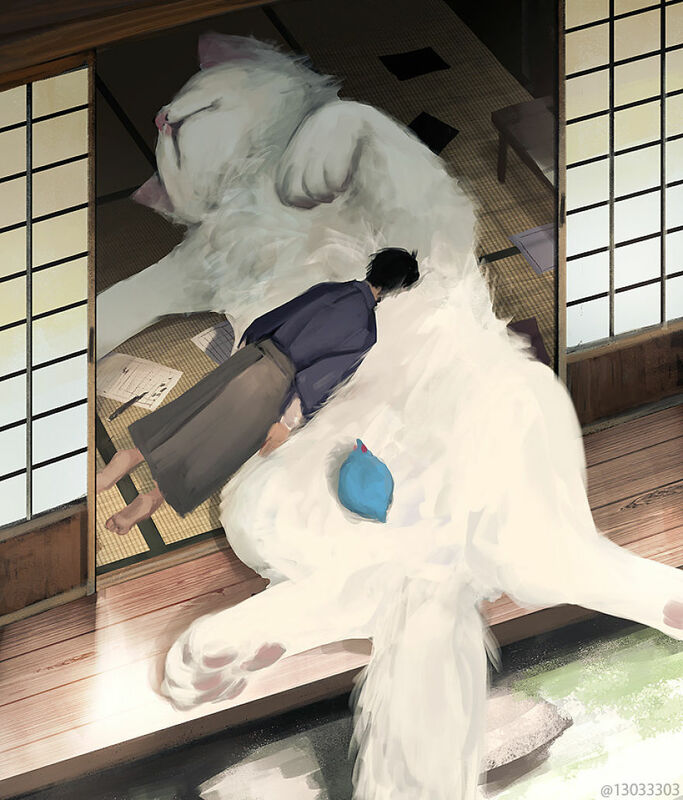 I do wonder what it is about blue chickens and giant cats. Don’t get me wrong, I would enjoy living in a world like this, and can actually see the appeal of both. 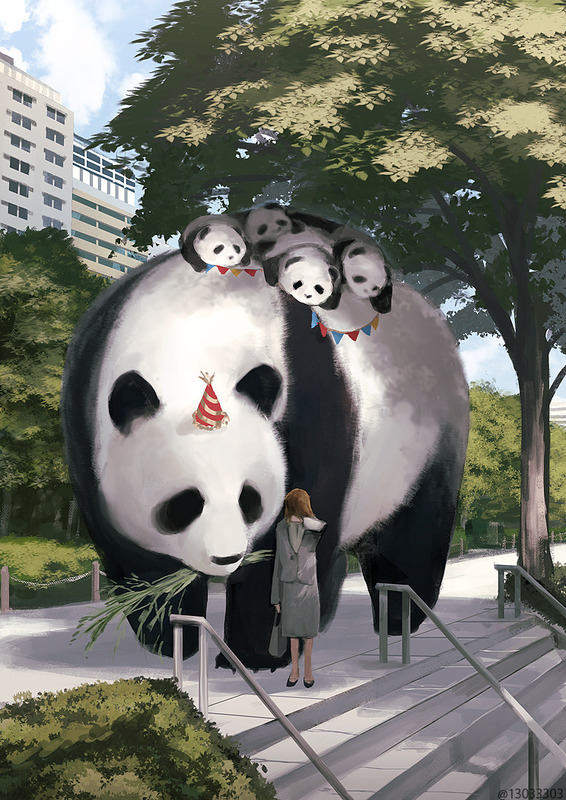 Here is a panda mom and her panda babies. It looks like they are going to a birthday party in the park. I wonder if it is her birthday or someone else’s. While this big kitty had the right idea when hiding, she didn’t take into account that she was so big. The person with the umbrella found her easily enough. I can’t understand why the cat would be surprised she was found so quickly. 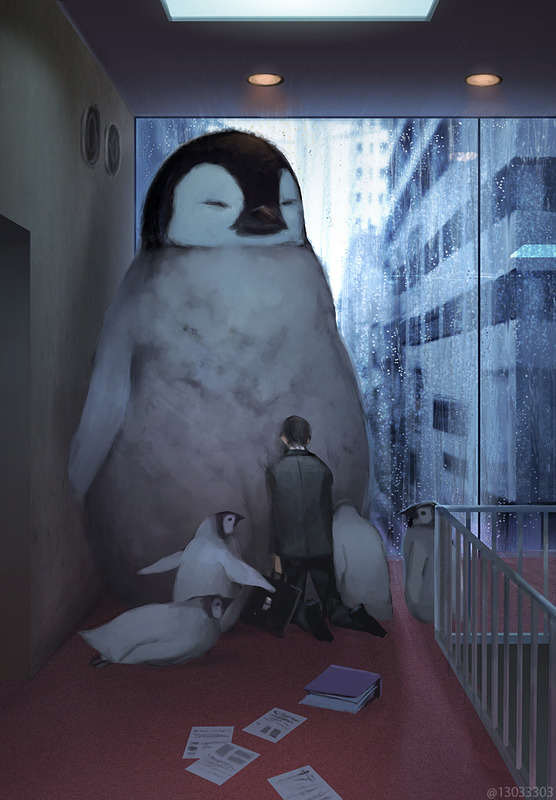 If you like penguins, then this is the illustration for you. The large penguin seems happy enough to be in the company of its babies and human friend. His human friend seems to be happy to see her as well, after seeming to have returned from a long day at work. 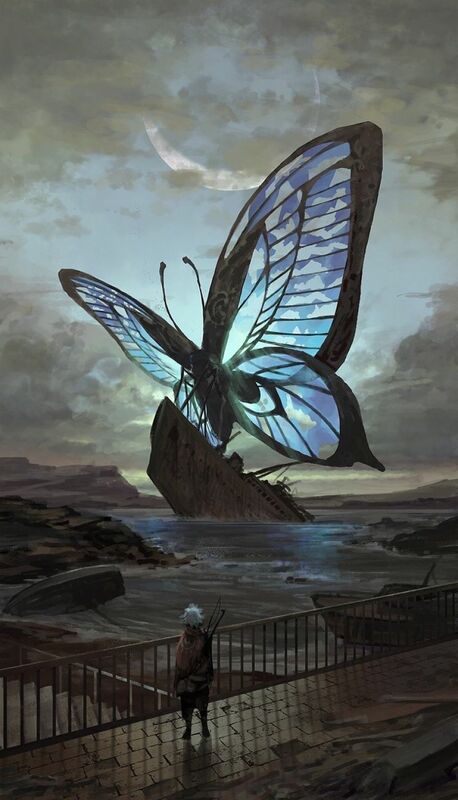 Wow, what a big butterfly! I love how the sun filters down through the wings. The person on the shore seems to be staring in awe at the majestic beauty before him. This girl and her animal companion seem to be having the time of their lives. What a better way to spend a day than picking flowers from the garden and wearing them in your hair, or fur in this case. 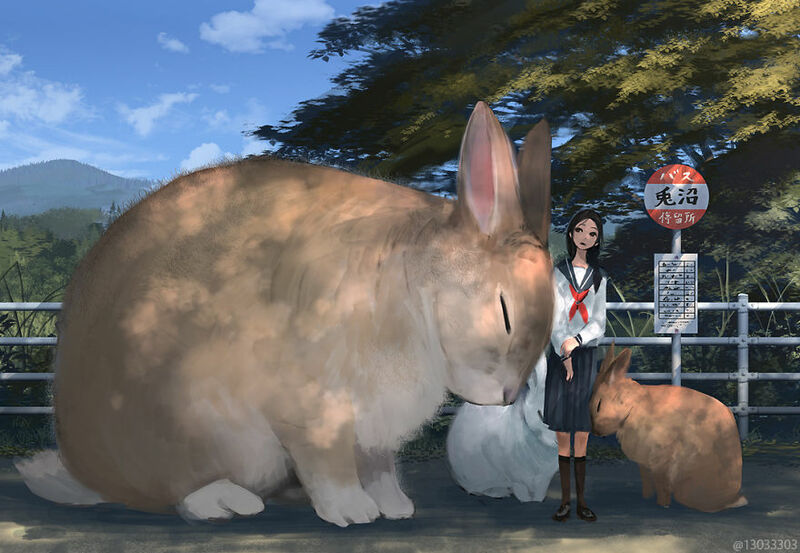 These large bunny rabbits seem to be enjoying being in their human friend’s presence. Here they are snuggling up to her as she waits for her bus. Hopefully they won’t follow her where she is going. 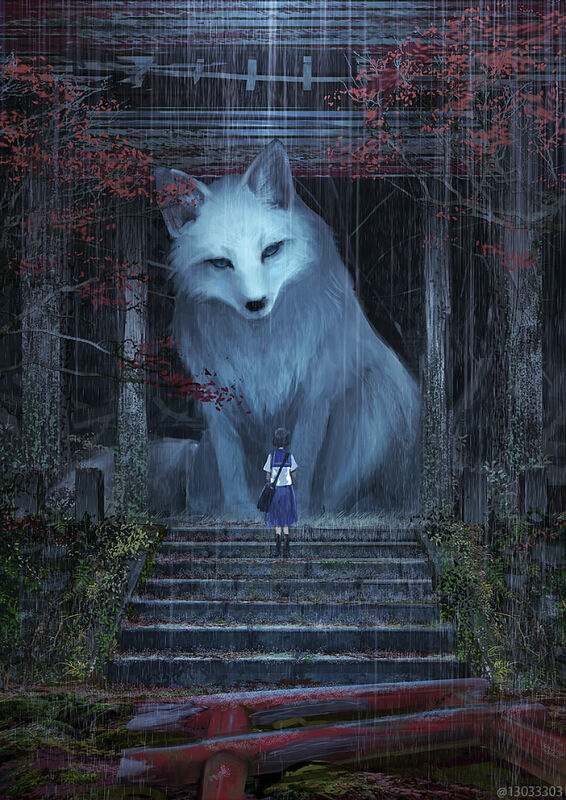 This fox -like critter is meeting her friend on the frozen lake outside of the city. 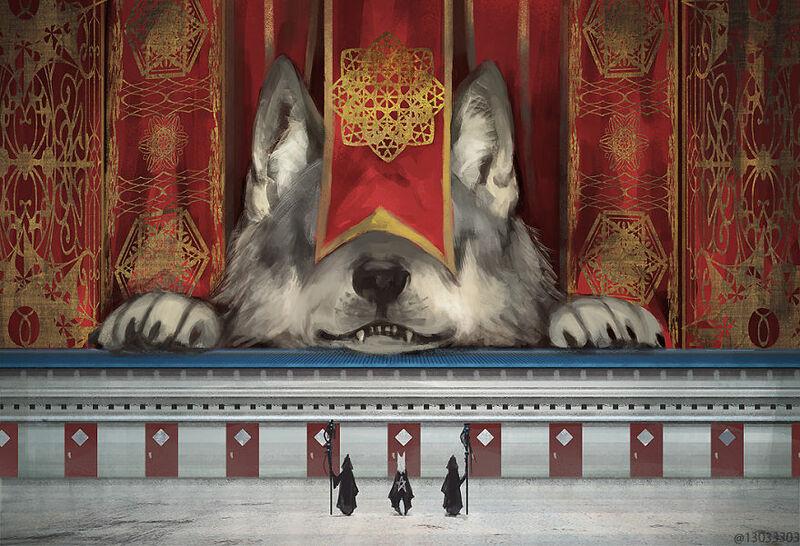 She extends a large paw in a sign of friendship while her human associate stands calmly by. 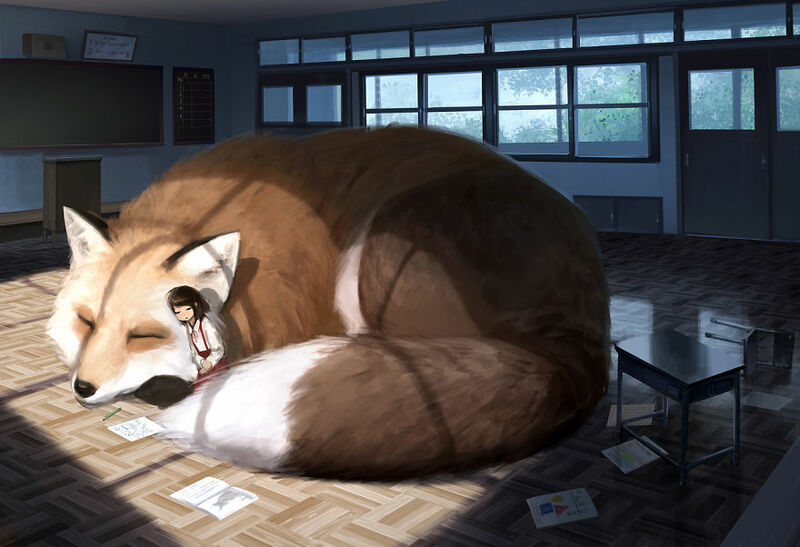 Here is another nap in the sun, this time involving a giant fox and his human friend. I always wonder why you always see papers scattered about in these photos. It’s almost like they were in the middle of reading or writing, said forget it, and threw all of the papers into the air before snuggling in for a nice nap. 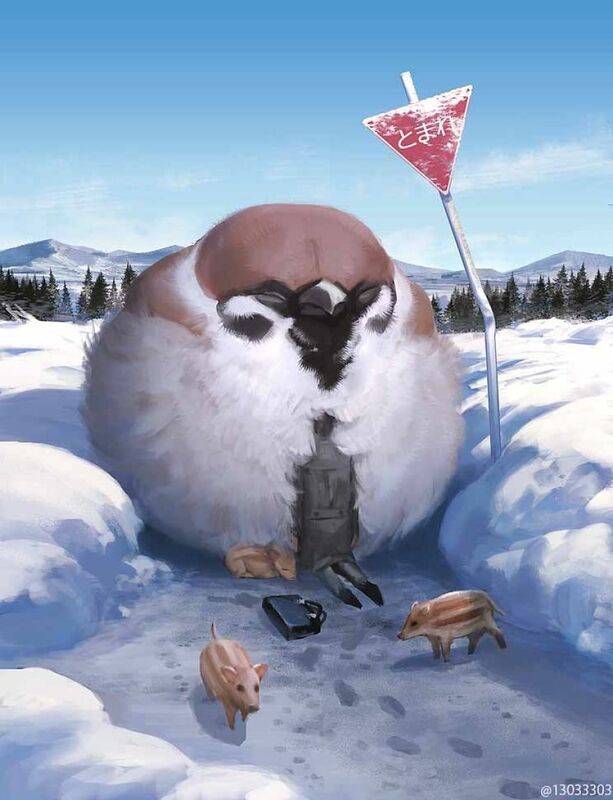 This large bird is sticking by his companion’s side, no matter what. 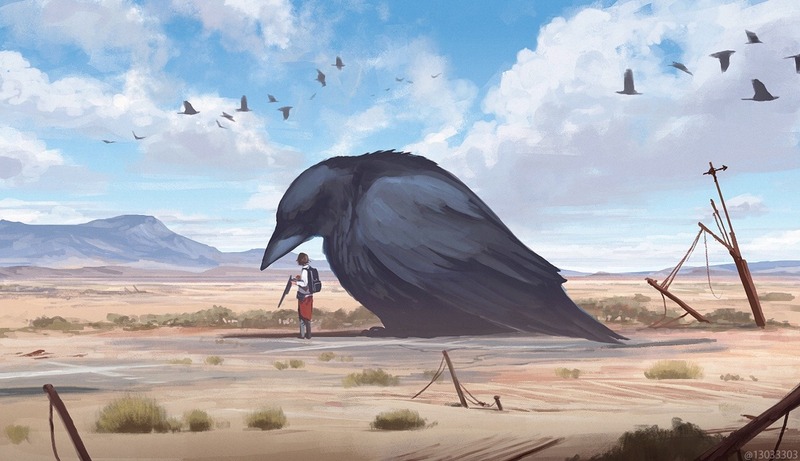 Overhead, a flock of smaller birds flies by, but the giant raven only has eyes for his human friend. 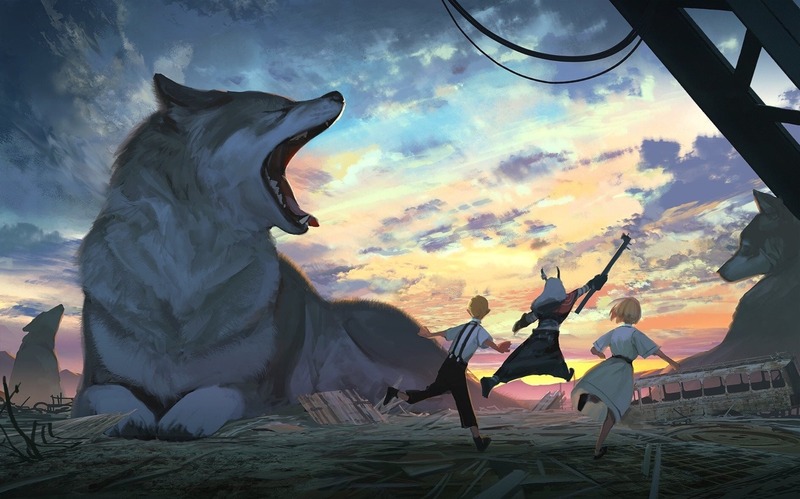 This group of humans seems to be caught by surprise as they run through this pack of giant wolves. This might be because they were not expecting such a big yawn from a normally quite animal. 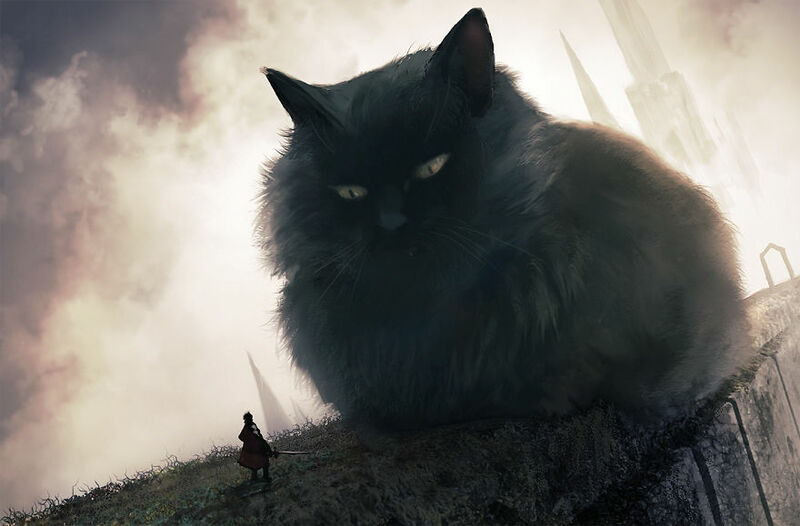 This fluffy cat is cute no matter how big she is. The human on the other hand has his weapon drawn like he expects trouble. I got news for him, all it would take would be one, well-placed swat and all his worries would be over. 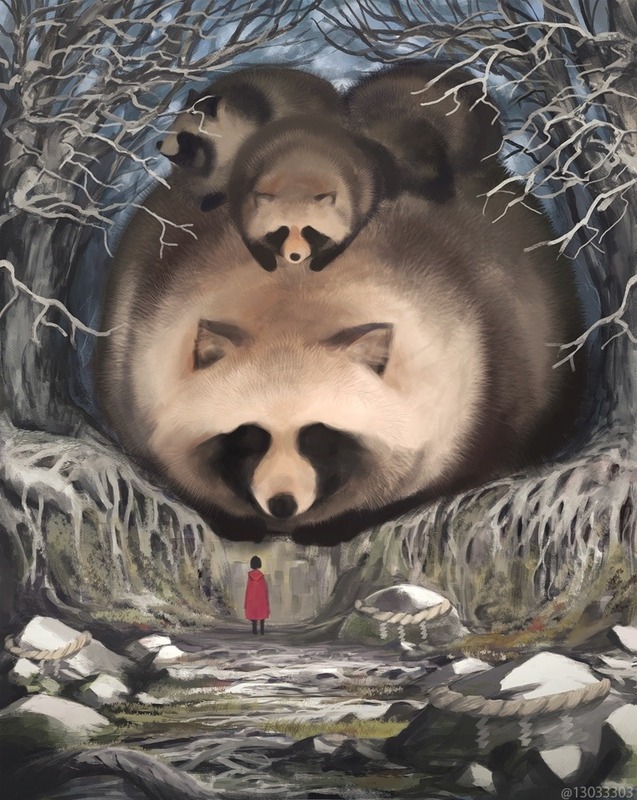 Here is a mom and her baby raccoons all pile up in the forest. It would seem that a human has happened across them on her travels. But the human seems harmless enough and mother raccoon is not about to move and wake up her babies. This woman is sweeping the leaves and debris from the top of the stairs while her raccoon friend sits quietly by. 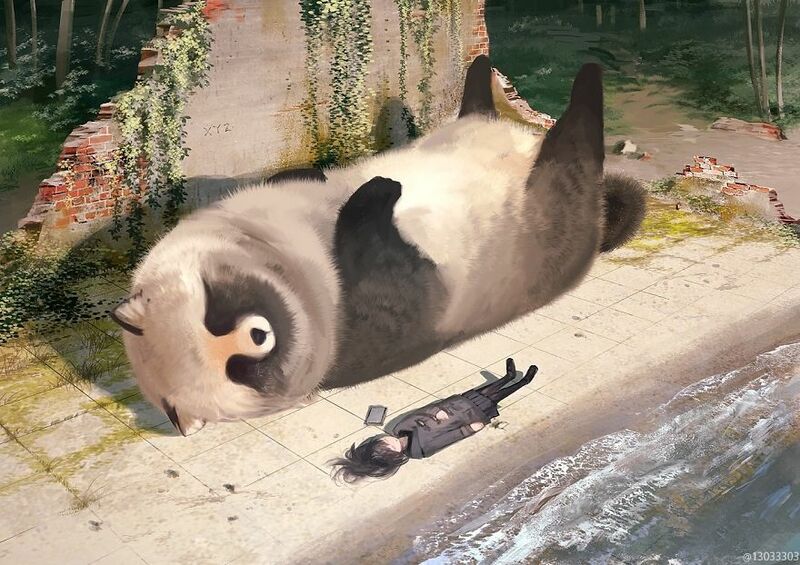 This must be a favorite time for the giant raccoon as he seems to have a smile upon his face. This giant warthog looks intimidating, but is content to let the humans pass quietly by. The older human seems to understand the danger him and his younger companion are in. his younger companion on the other hand is not so wise. This young lady has come across an unexpected sight on her journey down the river in her little red boat. 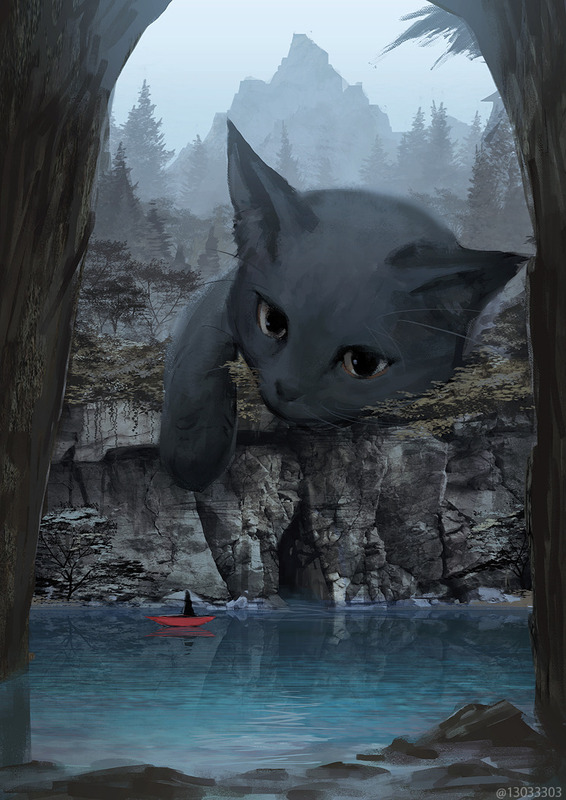 A gray cat watches lazily as she floats slowly by. All she would have to do is reach out and she could interrupt her peaceful trip. This trio has decided to take a quick breather on their trip. Luckily, for them, they came across two accommodating animal companions willing to share their soft, warm fur. Oops, there’s the blue chickens again. 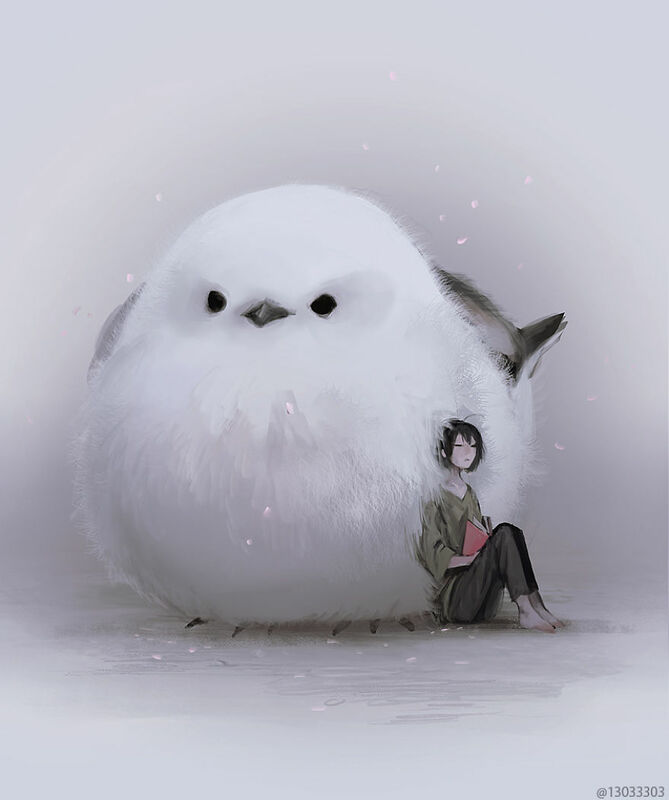 This little chick is quite content to sit quietly while her companion reads. Maybe the human is reading her a story, though it looks like she has fallen asleep. The chick, for her part, is scared to move lest she wake her friend up. It would seem this traveler has run head on into a little bit of a roadblock. And what is up with the little pigs running around underfoot? Hopefully, this big bird gets out of the way so that the traveler can get continue on his way. 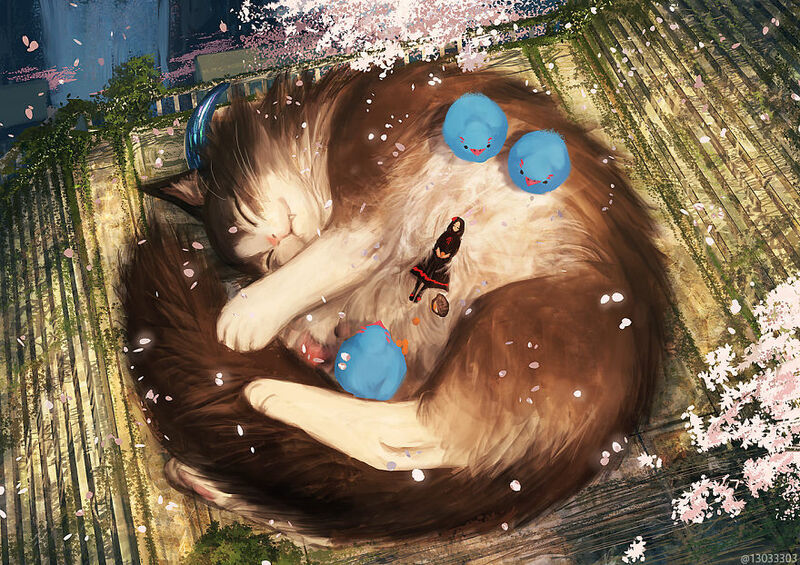 It looks like this person has had a hard day to the point that he automatically passed out upon walking through the door, right on to his animal companion’s soft fur. Oh look, it is another one of those blue chickens. What’s up with that? 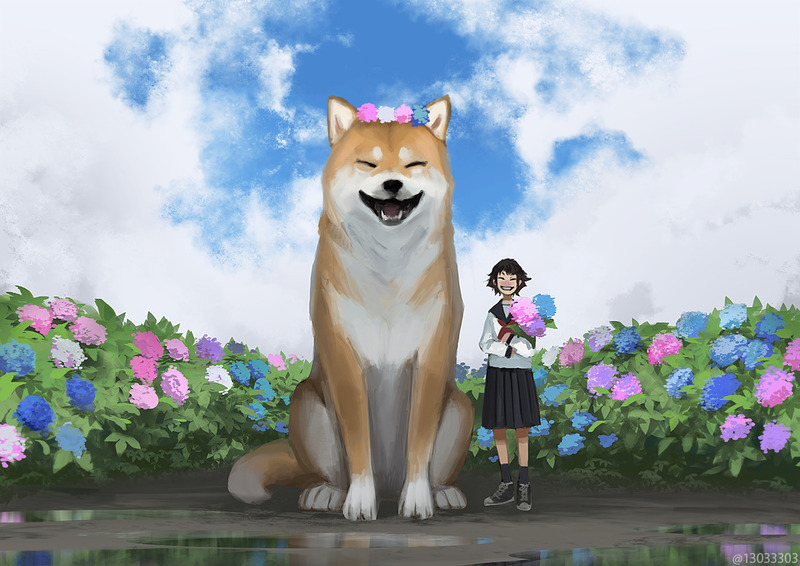 Not every picture is of a giant animal sitting by cheerily with a smile on its face. 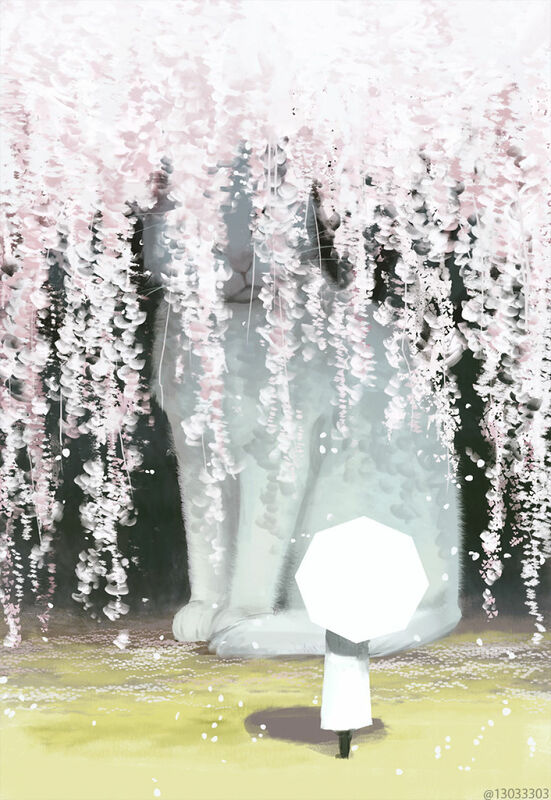 In this one, what looks to be a cat has decided that it has had enough of the staring masses, and is content to rest quietly in the dark, at least until tomorro2w.